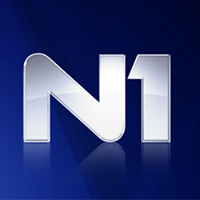 News TV Channel / N1 is a 24-hour cable news channel launched on 30 October 2014. The channel has headquarters in Belgrade, Sarajevo and Zagreb and covers events in ex-Yugoslav countries of Bosnia and Herzegovina, Croatia and Serbia. Available on cable TV throughout former Yugoslavia, N1 is CNN International's local broadcast partner and affiliate via an agreement with the London-based Turner Broadcasting System Europe. As it is focused on the audiences of the three countries in which it is headquartered, it has three separate editorial policies, separate reporters, TV studios as well as internet and mobile platforms. In cases where news overlap, information is presented jointly. Its direct competitor is Qatari-funded Al Jazeera Balkans.